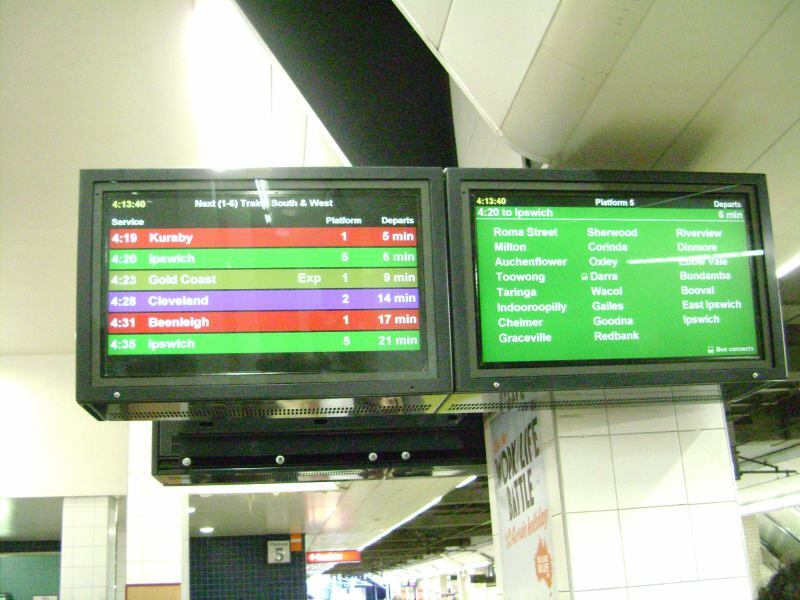 New passenger information displays (PID), same as the LCD ones at the Valley are now in use at Central station. Here is a picture on the 15th December during the initial installation. Had a quick look today (20th), new LCD screens have replaced the CRTs on the concourse and both sides of the main ticket windows. Much improved in clarity and information. I cruised through Central yesterday and was quite surprised to see these new displays. They are fantastic. Every station on the Citytrain network should have them. Every station on the Citytrain network should have them. This brings up an interesting point. I keep meaning to take photos of some of the dodgy LED displays in use at stations such as Bowen Hills, Eagle Junction and Northgate. A whole panel of the displays has been removed from Northgate - replaced with signs printed on A4 paper instructing passengers to check the other side for train times. I realise that suburban stations are prone to vandalism and sunlight may render LCD screens useless - but surely something could be designed for these major stations that could encase the LCD screens to protect them from theft/vandalism and provide enough shade to be able to read them in the middle of the day. 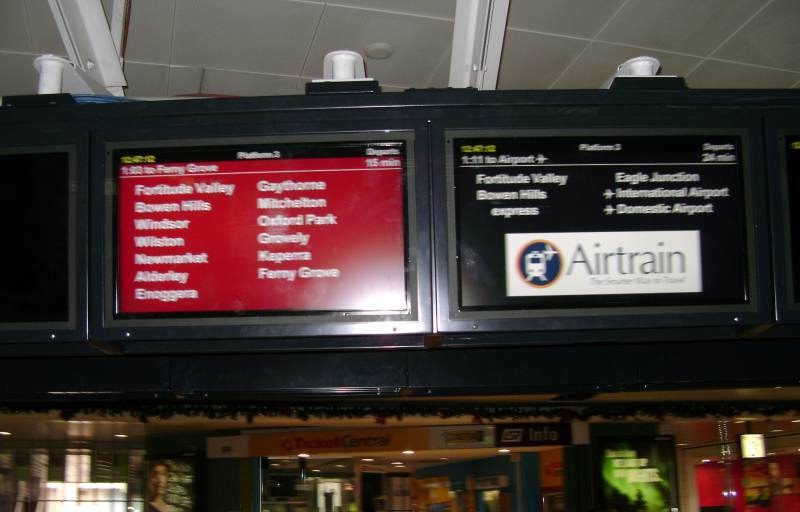 Some new dot matrix displays are due to go in at some stations. The casing for the displays were installed at Enoggera and Mitchelton a month or so ago. Obviously Enoggera is important enough for dot matrix displays but not an express service! A couple of photographs at Central of the new displays. This photograph is a little blurred, the displays are very sharp and clear. I keep meaning to take photos of some of the dodgy LED displays in use at stations such as Bowen Hills, Eagle Junction and Northgate. I was reminded of this post when I was at Northgate yesterday. I took a photo a few weeks ago - but now they have completely removed the display structure altogether. You now have to rely on the displays at the top of the stairs and on each platform. Perhaps they will replace it with something better? Enoggera has had the housing for new dot matrix displays for many months. However the actual display has yet to be installed. I wonder when QR will actually get around to installing the dot matrix display? 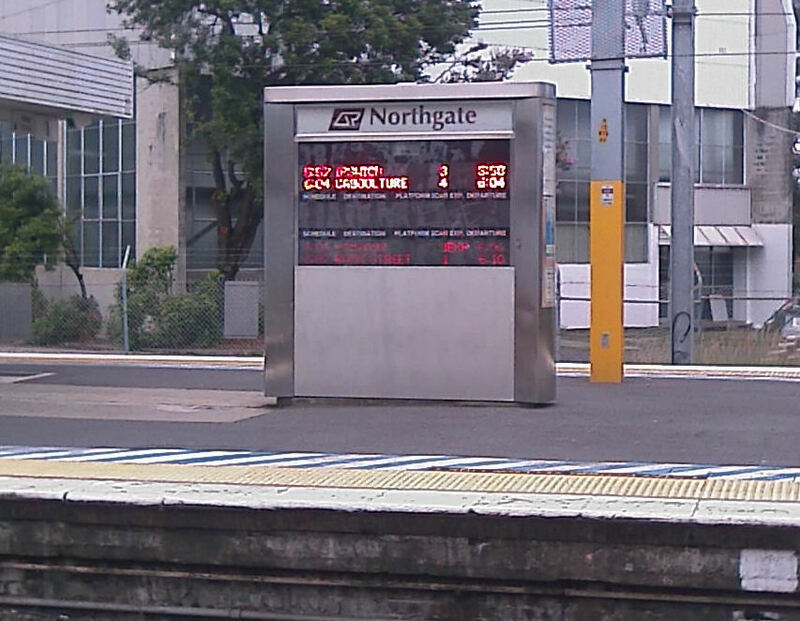 Nundah station has also had new dot matrix displays partly installed on all 4 platforms for a while too however not much has progressed as far as completion goes. 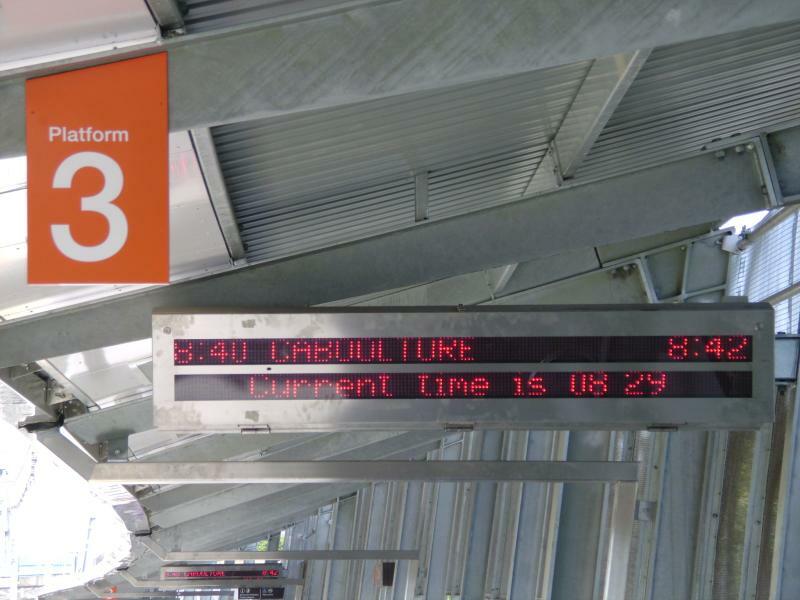 BTW, I'm looking forward to seeing Roma Street station getting some of these new LCD PID's installed . The display tower at Eagle Junction has also been removed. Surely they're planning to replace these with something better - and not going backwards in terms of passenger information! Heard an announcement at Central this afternoon that the PID's on the platforms would be unavailable this weekend. Sounds like they're replacing the old TV's with the LCD's. I don't think things went to plan over the weekend. Platforms 3 & 4 don't appear to have been touched. Platforms 1 & 2 have the new screens installed but they aren't working yet. I didn't see platforms 5 & 6. From my observations today, it appears that some 'recycling' has occurred in the screen upgrades. Yes, new LCD screens are placed and in use on platforms 1 and 2. However the former screens have been redeployed to platforms 4-6. Existing screens on those platforms have been relocated slightly and a 'TIME IS' screen added strategically to each platform, albeit facing only one way. All screens are the older analogue type. On another note, has anyone else noticed the new plasma screens above to the entry points which show images from the adjacent security camera, like in the supermarkets. Maybe Woolies might be taking over CITYTRAIN. Seems there's more dollars in the coffers than what we are being told, if they can afford this B.S. They were still off this morning. Are they on now? The "TIME IS" screen has always been there. It lets the guard and station staff know the time as per the PID's for consistency. Answering my own question - yes. They were on this afternoon when I headed home. They're still not operational at the Fortitude Valley end. I love those new screens, really clear and easy to read. All operational on platforms 1 & 2 this week. Hopefully they roll out the other platforms soon. Platforms 5 and 6 have the new LCD PIDS, platforms 3 and 4 to go. New PIDs on platform 5. Thanks for that pic ozbob, being on rec leave ATM I haven't been into city for a few weeks now. 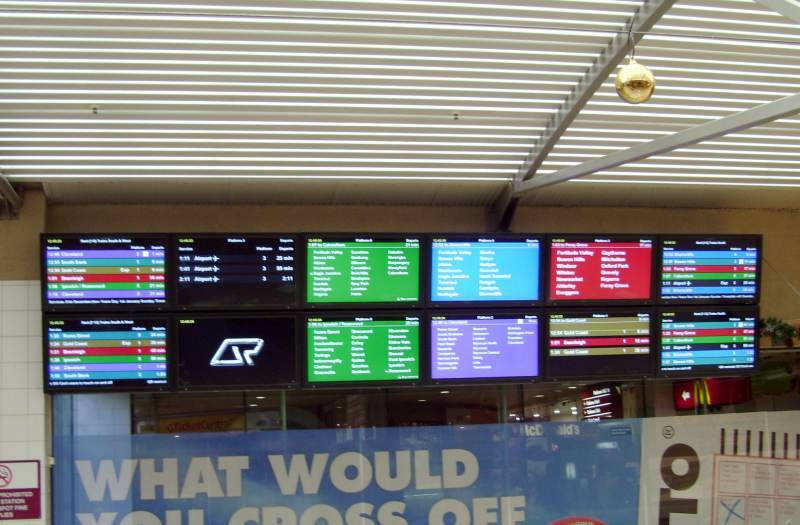 Any sign of these new LCD PID's being installed at Roma Street railway station yet?? I noticed a new bank of around 4 screens viewable as you head down the escalator on platforms 5 & 6. I'm not sure if they have the same on 1 & 2. Several of the screens on platforms 5 & 6 aren't yet operational. Some are operational but still have the protective plastic on the front! Nothing at Roma St yet Sunbus610. Still the old displays. Hopefully they will be done eventually. I quite like the old CRT displays. It will be very sad when they are finally gone. Thing I like about them is that they have the direction indicated above them, eg "Trains South/West", brightly lit. The new displays have it hidden in black and cannot be read from a distance. Unless otherwise stated, all views and comments are the author's own and not of any organisation or government body. I remember seeing a thread for this a little while ago but can't find it now, the info displays that were installed at some stations are now operational at least at ferny grove station. Although they still need a little work... they were advertising a train departing but were also listing it as not stopping at the station. next step is to get sychronised clocks. They started rolling these out in Sydney a number of years ago so every station with a clock (usually the timing stops) would show the exact same time to the second. The new ones (at ferny grove) appears to show some non trains, for example when i get at the station at 7 for my quarter past train it was showing that there was a train leaving my platform for awhile before it changed to my Cleveland train. It shows non passenger/return to depot/special trains as "Express", which it really shouldn't do, especially since it says "Not stopping at this station". They are currently in a cluster of four (two facing each way) and they are only on the main/first section of the platform and way to close to the ticketing office so you can't really see one said unless your close to the building. 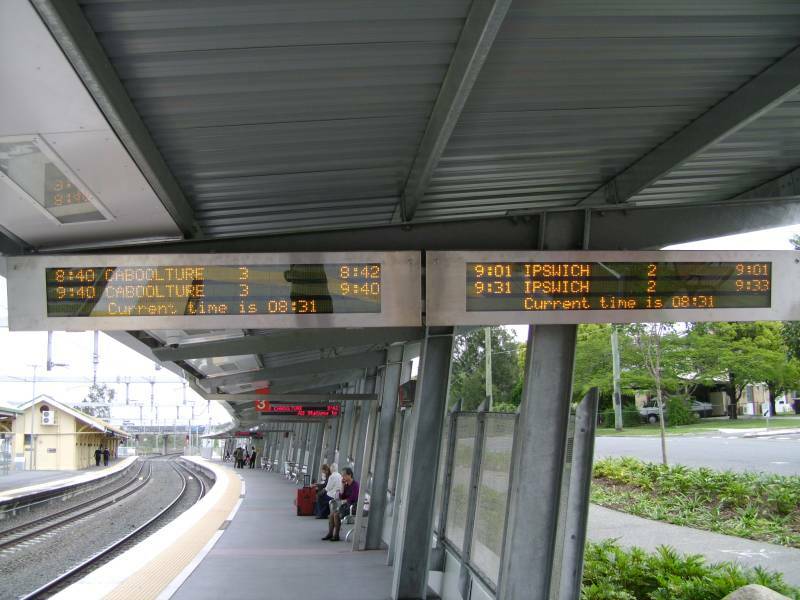 New Dot Matrix displays finally in use at Enoggera. PIDs on platform 3 Oxley are now operational. Does anyone know whether Platforms 1 and 2 at Oxley will be receiving these lovely PIDs? Also, will the platforms at Corinda be getting them? They already have them on the concourse so why not the platforms? I have noticed that QR is preferring this sort of layout for the displays. Question is - Is it the best way of putting forward information to commuters? Is just saying "Express" too vague? Should QR go back to telling people which stations the train runs express to avoid confusion? They do, just wait a bit and it should flip over to the station list that it stops at. Some new PIDs platform 3 Oxley east. 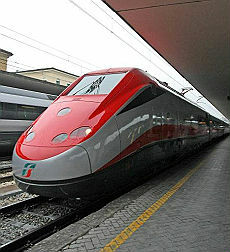 New stations, new trains, new logos, new uniforms... but where are the new train services??? The left image is great for a "improve the frequency" campaign!!! 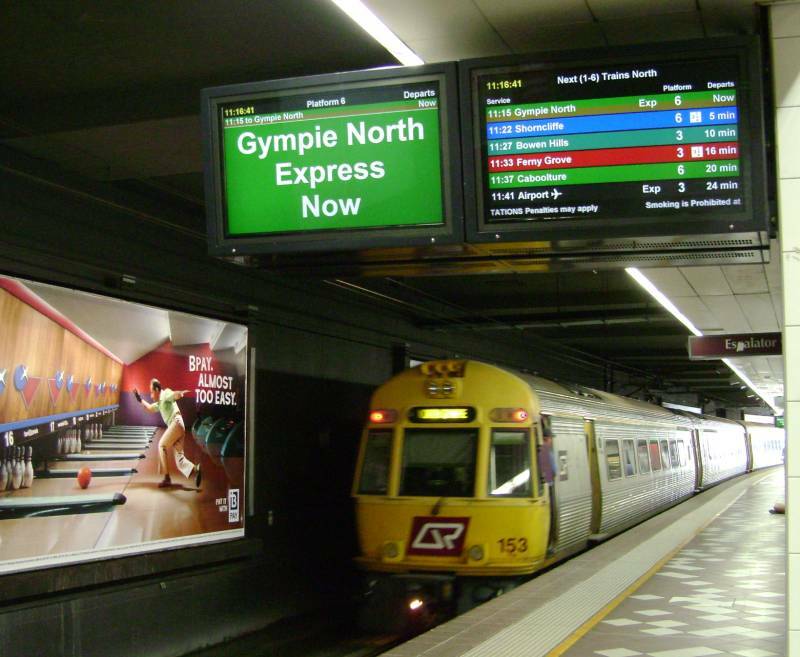 "Gympie North Express NOW" it would say! New stations, new trains, new logos, new uniforms... but where are the new train services??? .. I daresay 15 minutes should be standard. The entire weekday timetable is hard to figure out what is on when. It should just be a standard timetable for the entire weekend. I came in on the 8.40am ex Oxley this morning. About 30 pax on the platform. Quick count about 300 pax on the 6 car train. There was 101 bertie that made it to Oxley about 8.31am, 9 folks on that. It can miss and the bemused folk then have to wait till 9.40am for the next rain. It is really ramshackle the whole set up. The 9.40am from Oxley is generally very well loaded, usually all seats gone (500 pax) and a few standees. Surprising is it not? But if they could get to the station a bit easier I am sure there would be more.